Microsoft has revealed a plan for a slow-moving upgrade of its Office suite’s user interface, with three new elements to start appearing at Office.com and in Office apps in coming months. The changes bring the “fluent design” concept Microsoft has adopted in other products to Office. That claim’s backed by the Ribbon gaining coloured icons that show collaborators on a document. The colour assigned to the icon will also be used to denote contributions to a document made by that individual. Microsoft’s also talked up new menu animations, plus “inclusive and accessible” icons that use colour to achieve “higher contrast”. Search will become more prominent with Microsoft saying it “will become a much more important element of the user experience, providing access to commands, content, and people.” There’ll even be a “zero query search” that “will bring up recommendations powered by AI and the Microsoft Graph” as soon as you place a cursor in a search bar. Automated recommendations reflect Microsoft’s belief that Office should deliver the commands users are likely to want while they work, rather than making them pause to hunt something down. This thinking is in line with Microsoft’s current enthusiasm for minimising user distractions. 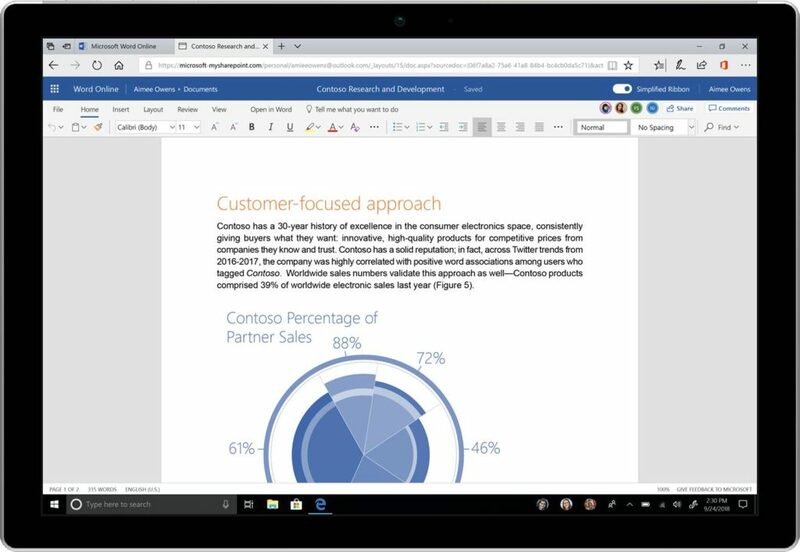 The new UI will come to Word, Excel, Outlook and PowerPoint, for starters.